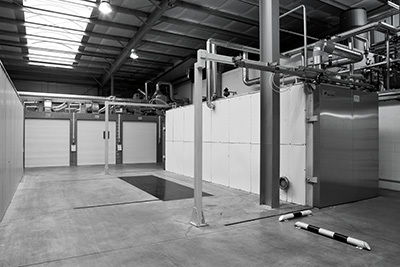 One of the most modern and environmentally friendly ethylene oxide (EO) sterilisation plants in Europe. post-conditioning for extremely low residual gas levels – sometimes below the detection limit. When products come close to people, or are inserted into them, sterility is an absolute necessity to ensure safety and tolerability. Therapeutic items cannot be allowed to introduce a bio burden into the treatment process. Sterilisation reduces the microbial burden to zero. As medical products are becoming ever more complex and are often made from several different materials, this means that an increasing proportion can only be sterilised with ethylene oxide. EO penetrates both the packaging and the product itself, killing any microorganisms left over from the manufacturing process. Unlike sterilisation with steam or heat, EO sterilisation is a chemical process that prevents protein metabolism in bacteria and other microorganisms. It does not require high temperatures, making this form of sterilisation ideal for plastics. We operate two separate fully automatic sterilisation plants. They represent the state of the art, with separate areas for preparation, actual sterilisation and degassing. Development of specially adapted sterilisation cycles via a certified quality management system from first contact up to implementation. packaging type: paper, Tyvek, film, vacuum packaging, other. 3. You place an order. 4. We prepare a validation plan for approval by your validation authority. 5. Validation is carried out. 6. You receive a validation report. 7. You approve the report. 8. Moving on to routine sterilisation. Sterilisation service. Find out what’s in it for you! We’ll be glad to give you comprehensive and individual advice.